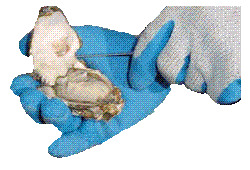 Grasp the top shell near the hinge (or push it open with the tip of your knife if you prefer) and lift it off the oyster. Since you´ve cut the muscle it will be free from the oyster. Throw the top shell away.